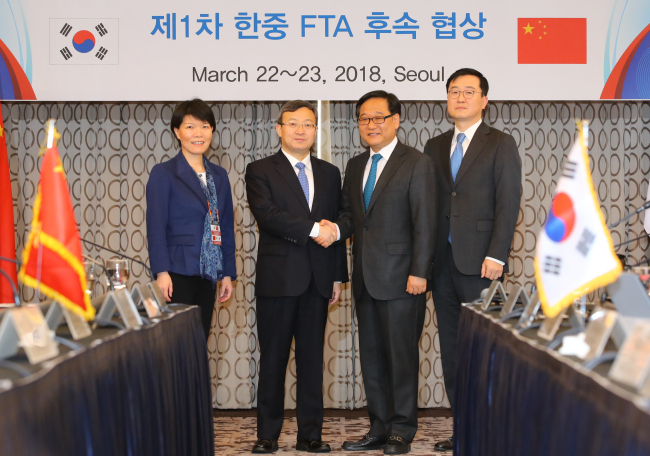 South Korea and China will hold the second round of talks to expand the scope of their bilateral free trade agreement this week to better cover the service and investment sectors, Seoul's trade ministry said Tuesday. The two nations engaged in the first round of FTA follow-up negotiations in March and have agreed to discuss details of the agreement in Beijing from Wednesday to Friday, the Ministry of Trade, Industry and Energy said. The two sides implemented the FTA in December 2015 to lower tariffs on goods. "The follow-up FTA negotiation is expected to strengthen the legal framework for expanding the two nations' service market and investment opportunities under a rapidly changing global trade environment," the ministry said in a statement. "The government will support local companies' efforts to enter the Chinese market in promising service sectors, including tourism, culture, finance and health care, while seeking ways to enhance the investor protection measures." China has been reducing its focus on manufacturing to restructure its economy to be more service-oriented. China's service industry was estimated to be worth some $5.6 trillion in 2016, making it the second largest in the world.